The labrum is the cartilage bumper along the socket. A labral tear in the hip can be a limiting cause of hip and groin pain in athletes. Often a labral tear can be the result of a specific event or trauma, but occasionally the athlete does not remember a specific injury. Labral tears often manifest as deep groin pain or catching inside the hip with activity. A sports medicine physician can perform a thorough history and physical examination in the office, but often the exam is unremarkable. Occasionally pain with axial load to the hip and flexion with internal or external rotation can recreate pain or a clicking sensation. X-rays are usually unremarkable. 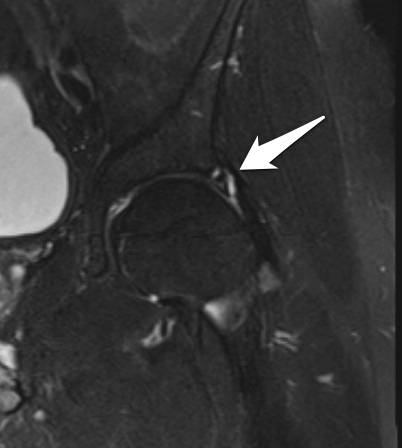 An MRI with contrast injected into the hip (MR arthrogram) can often reveal the labral tear. To determine if the labral tear is in fact the source of pain, the physician can inject a local anesthetic, like lidocaine, into the joint to see if the symptoms are temporarily relieved. If a labral tear is seen on MR arthrogram and the injection relieves the symptoms, surgical treatment can be attempted. Nonoperative treatment, including rest or avoiding offending activities, anti-inflammatory medications, and physical therapy can be tried initially with some success. If nonsurgical treatment fails, surgery to arthroscopically debride or even repair the labrum can be attempted. Recovery from surgery can be lengthy if the labrum is repaired or fairly quick if it is only debrided. Unfortunately removal of some of the labrum, which is sort of a shock observer of the hip, can have long-term consequences, especially in athletes who perform repetitive impact activities, like runners.